Pakistan completed a convincing clean sweep of the T20 series in front of a roaring Pakistani crowd; it will be harsh to call it just Lahori. The sentiments were there, emotions ran through the players and the crowd alike; after all, cricket came home to Pakistan. It was much more than a cricket match, it was about showing the world that Pakistan is a peace-loving country, eager to host international teams. Pakistan’s bowling attack was hard to stop and the new-look Sri Lankan side proved to be a wall of sand before the likes of Hasan Ali, Usman Khan, Mohammad Hafeez etc. falling for just 102. Despite an early hiccup, Malik and Hafeez ensured that Pakistan crossed the line with ease, winning by 7 wickets. The second contest of the series proved to be a thriller. Sri Lanka had a good start but failed to capitalise at the end, thanks to the first-ever hat-trick by a Pakistani bowler in T20 Internatioanls. It was meant to be an easy chase for Sarfaraz XI, but they produced what they’re known for; the unpredictable XI. It came down to a Shadab-six which won it for Pakistan despite a top-order collapse. Shadab proved his worth as a brilliant all-rounder yet again. After making two changes in the XI (Umar Amin and Mohammad Amir), Sarfaraz’s men were put into bat. Umar Amin’s 45, Malik’s blistering half-century (51 off 24) and two huge sixes in three balls from the Razzaq-like Faheem Ahsraf took the score to 180/3. Sri Lankan team, which returned to Pakistani shores after the horrible March 2009 incident, was dented by early blows from the returning Mohammad Amir, Hafeez and Imad. Thisara XI never looked like chasing down a target of 181, but a quick-fire fifty from Shanaka gave them some hope, just before Amir returned to take career-best figures of 4-13 in his 4 overs to restrict Sri Lanka to 144/9. Pakistan’s most experienced T20 player, Shoaib Malik stole the awards ceremony with both ‘Man of the Match’ and ‘Man of the Series’. And if India defeats NZ in the 3 match t20 series, Pakistan will top the ranking in t20 internationals. ODI me beat kr dia ha aur India home ground pr hi perform krti ha. 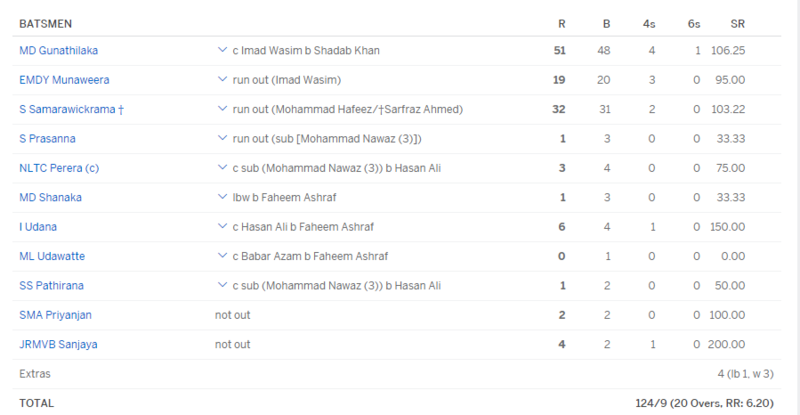 t20 me beat kr dega I think NZ ko.